Tomatoes are a beautiful fruit. I love their bright colors; light pink, cherry red, golden orange and sunny yellow. My culinary heart skips a beat at the sight of beautifully hued tomatoes all decked out in their speckles and stripes. 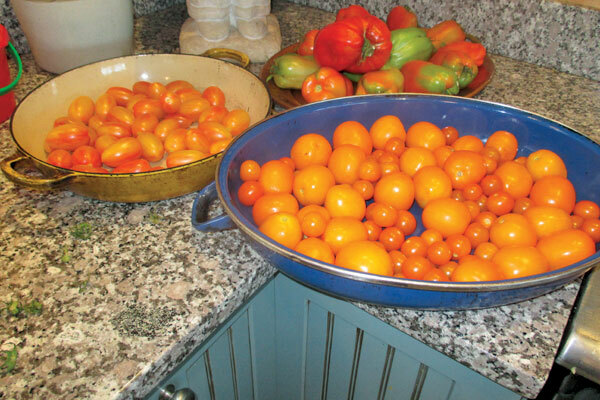 The recipe for Roasted Tomato Sauce is adapted from Barbara Kafka’s book, “Roasting, A Simple Art.” For the novice and seasoned cook alike, Kafka’s seven-page treatise on the art and science of roasting and cooking with the roasted tomato is a fascinating read. For example, I was reminded that tomatoes don’t need to be perfectly ripe to be roasted (think of doing this with all those under ripe tomatoes picked just before frost). The process of roasting actually enhances the sugars, turning a ho-hum product into something tasty. 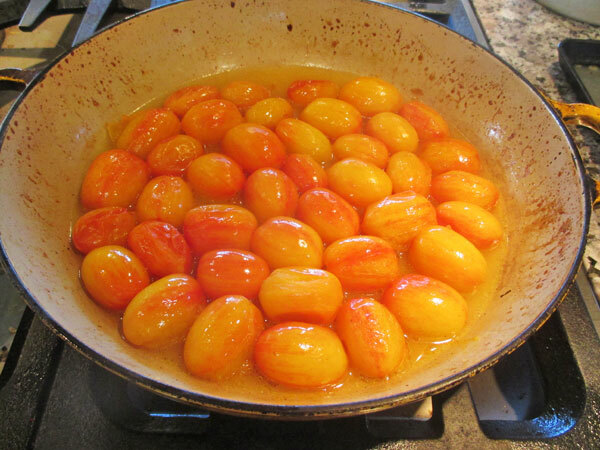 Roasted tomatoes add a depth and richness to stocks and sauces. 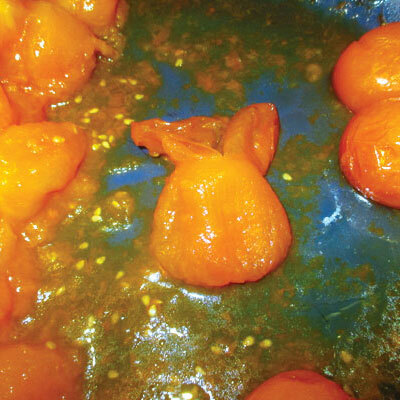 Tomatoes when roasted and then pureed yield a thick, creamy, intense, tomato sauce. Plum tomatoes or sauce tomatoes roast best, as there is a high flesh-to-juice-and-seed ratio. Although a bit seedier, cherry tomatoes are a great roaster also. Their sweetness only intensifies with heat. A food mill or screen is a quick and handy way to remove the seeds. 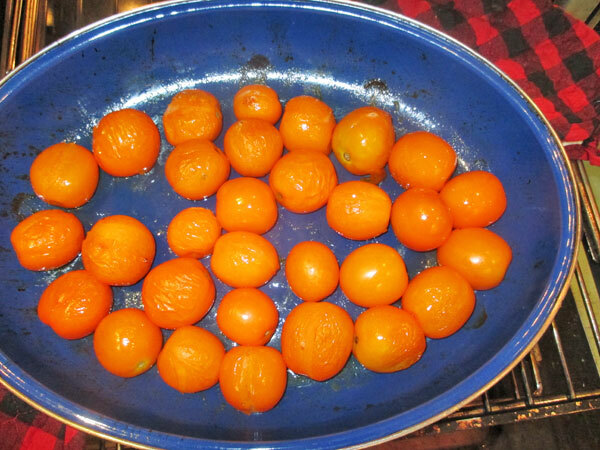 I roasted Sunrise Gold cherry tomatoes with Blush, an artisan variety, small, striped tomato. (Seeds from Johnny’s) Because we don’t like the texture of seeds in sauce, I used a screen to remove them. 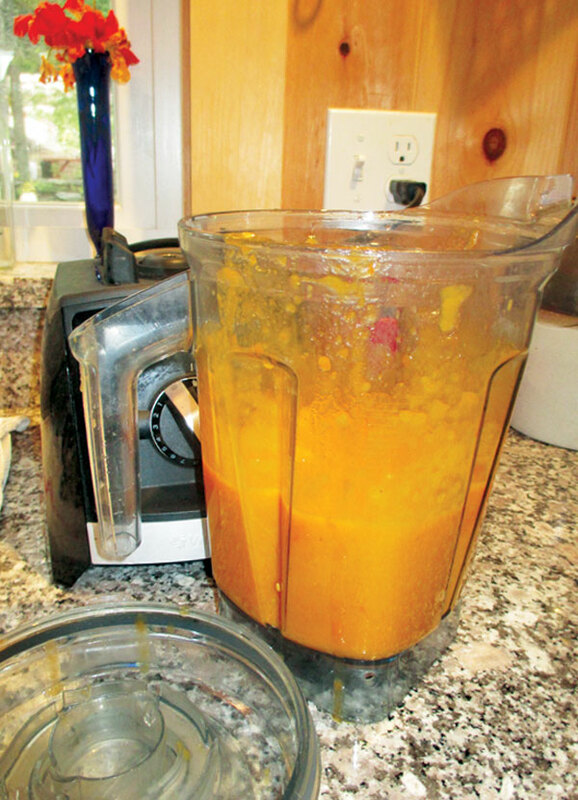 This creamy, pale-orange sauce was delicious! 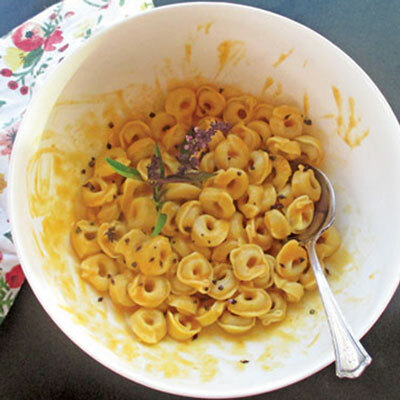 Our satisfying, easy and colorful supper was cheese tortellini tossed with roasted tomato sauce and bright purple basil. Place rack in the center of the oven and preheat the oven to 450 degrees. Grease a heavy baking pan or dish that will fit a single layer of the tomatoes comfortably. Use more than one pan if needed. Wash and dry the tomatoes. 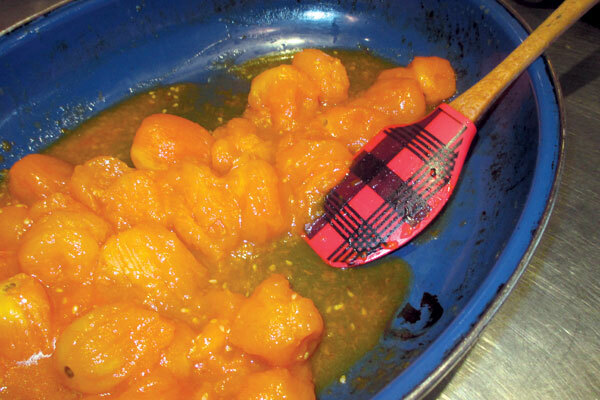 Fit a single layer of tomatoes into the greased pan and drizzle with olive oil. Coat the tomatoes well and roast for about 10 minutes. Remove the pan from the oven and shake the pan to loosen and turn the tomatoes. Return the pan to the oven and continue to roast, shaking occasionally, until the skins have split. Remove the pan from the oven and allow to cool until you can handle the tomatoes. Using a spatula, scrape all the roasted tomato goodness off the pan. Puree the mixture in a blender. 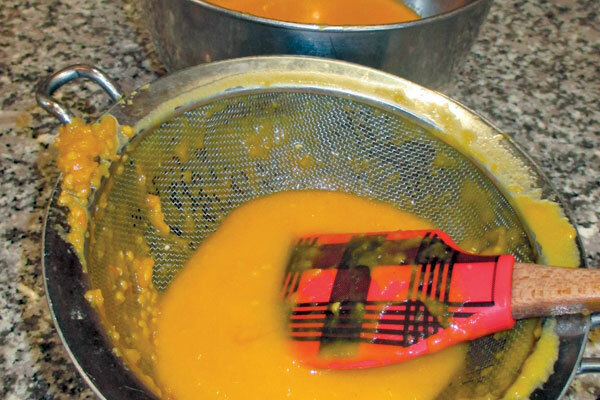 If you want a satin-smooth sauce, run the mixture thru a food mill or screen to remove the seeds and small bits of skin. Season the sauce to taste with sea salt, fresh pepper, and finely chopped fresh herbs. Three pounds of tomatoes makes about 3 cups sauce. Nutritional analysis per ½ cup of sauce (varies with the tomato type): 60 calories, 2 grams protein, 10 grams carbohydrates, 1 gram fat, 6mg. sodium, 2 grams fiber.